Qualification & experience: 10+2 (with atleast 50% Marks) and one years’ course in Computer Applications/NCVT Certificate (with atleast 50% marks) or graduate with one year course in Computer Application/NCVT Certiticate (with atleast 50% marks) or 3 years diploma in Modern Office Practices/Office Management & Computer Applications/Computer Engg./Electronics & Computer Engg. With atleast 50% marks or Post Matric one year ITI Course/NCVT in Stenography (with atleast 60% marks) and Data Punching Speed of 8000 key depressions per hour and One year experience in Data Punching. Consolidated Monthly Remuneration: Rs. 10000/- (RupeesTen Thousand Only). Qualification & experience: B.Com from recognized university (with atleast 50% marks) preference will be given to the candidate having knowledge of computer and experience in maintenance of accounts. Consolidated Monthly Remuneration: Rs. 12000/- (Rupees Twelve Thousand Only). Qualification & experience: On deputation basis from Govt. Organization/Society/ Corporation. OR Retired BDPO/Project Officer having five year experience in MGNREGA OR Additional Block Programme Officers who have experience of 5 Years. Consolidated Monthly Remuneration: Rs. 30,000/- (Rupees Twelve Thousand Only). 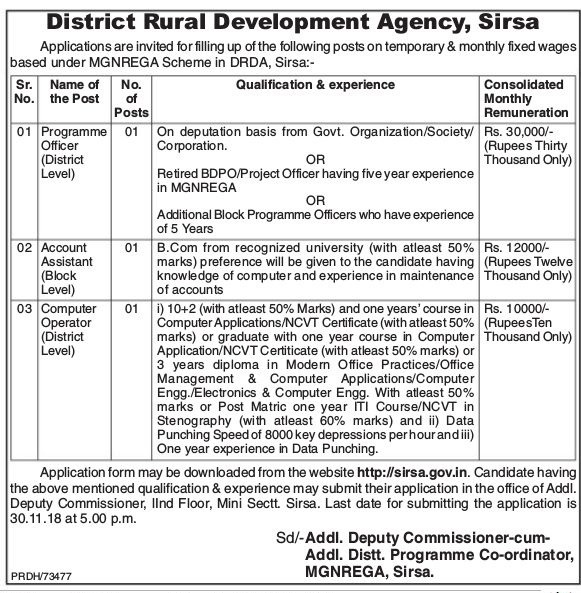 How to Apply: Application form may be downloaded from the website http://sirsa.gov.in. Candidate having the above mentioned qualification & experience may submit their application in the Office of Addl. Deputy Commissioner, lInd Floor, Mini Sectt. Sirsa. 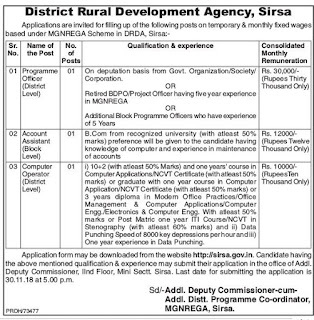 Last date for submitting the application is 30.11.18 at 5.00 p.m.
0 Response to "District Rural Development Agency Sirsa Jobs 2018-19 For 03 Computer Operator, Account Assistant, Programme Officer Posts"